Niacin aka vitamin B3 is found in many of the foods we eat today especially, meats and seafoods. Niacin is a controversial vitamin when it comes to supplementation. There is very limited research that indicates it may slightly lower thyroid hormone. But, I do not believe this to be conclusive research. 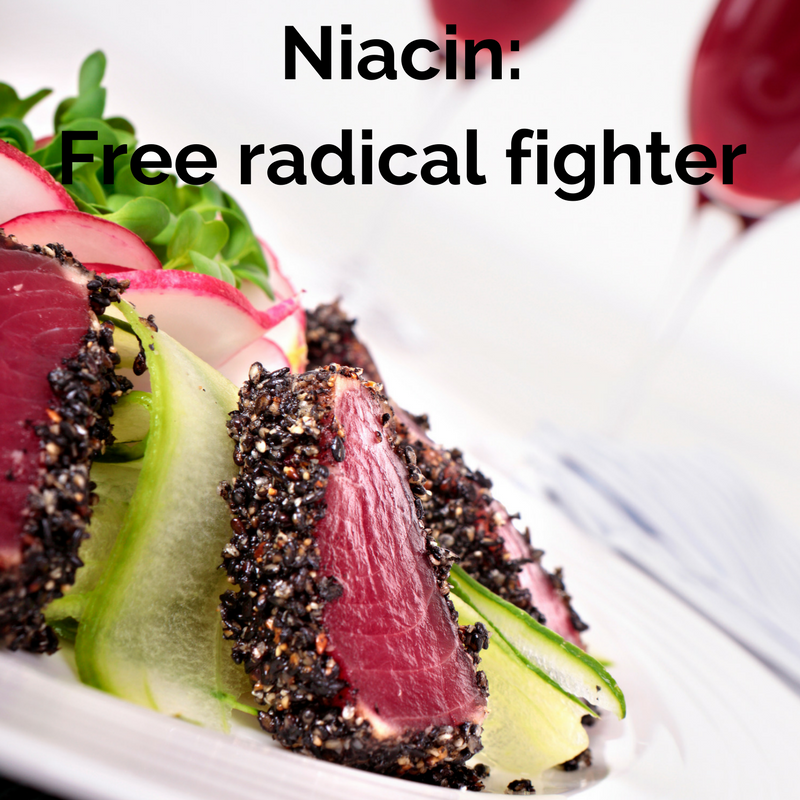 What I do know for sure is that when we get niacin in the whole food form it is crucial for promoting optimal energy and helping to fight free radicals and free radical damage. You often find niacin included in your multivitamin or B complex, and I do not consider this supplemental form to be a problem for thyroid levels. High cholesterol tends to be a problem for those with hypothyroidisim. Niacin is a popular treatment to try to reduce cholesterol. Not everyone responds to niacin supplementation and research is mixed. If your cholesterol is high and you have hypothyroidism, then the root cause is low thyroid hormones. I would not recommend using niacin to experiment in that case. Treat the root cause: the thyroid. *This article is not a substitute for medical advice. Please see your doctor before implementing changes. There are a handful of experimental studies out there showing niacin as an antioxidant or at least an antioxidant “helper” for the glutathione cycle. More research is still needed to understand niacin as an antioxidant. I see it as even more reason to make sure we are eating a balanced diet and getting all the vitamins and minerals we need in balance. A word of caution: Niacin should not be used for those with liver conditions, liver disease, or any other liver dysfunction. Next up: Vitamin B2 aka riboflavin! A little factoid for you all: riboflavin is what gives urine the yellow color when you take your B complex or multivitamin. In general, I do not think of ribofavin as critical for thyroid health, but it is much needed for helping out other key vitamins and minerals. Recycles glutathione. Glutathione is what I like to call the “master antioxidant” in our body. Anything we can do to make sure we have optimal levels of glutathione is key for reducing inflammation in autoimmune disease. 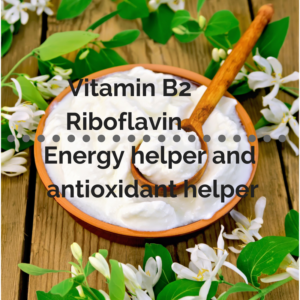 I generally think of riboflavin as a helper vitamin. It helps other vitamins, minerals, and antioxidants perform better in the body. Riboflavin especially helps with other vitamins and minerals that help the body produce energy like iron, folate, and B12. What are we all looking for with thyrid disease? Better energy! There should not be a high demand for supplementation since riboflavin is present in many foods we eat every day. However, vitamin B2 or riboflavin is included in most all B complex supplements. Here is my favorite B complex of choice. Next up is B1 also known as thiamine. 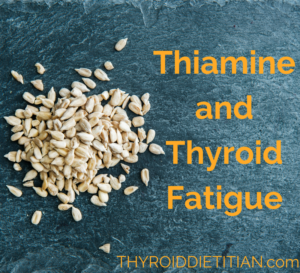 I am very excited to discuss thiamine today because it can be an easy vitamin to supplement with to help reduce fatigue! Many often think about taking B12 for energy, but those with Hashimoto’s need to look into B1 or thiamine for improving energy and reducing fatigue. Thiamine is critical for the production of energy and for the nervous system. There are some studies out there that show great promise for the effectiveness of thiamine supplementation. However, it is not a heavily researched topic. But, I will give you all that I know! This topic mostly relates to those with Hashimoto’s or autoimmune thyroid disease. We are not quite sure how or why, but we (healthcare professionals) think there is some sort of impairement in the process of transporting thiamine for use or an impairment using it in enzymatic processes. This mild deficiency of thiamine leads to lack of energy! Additionally, low B1 can reduce stomach acid production. Sufficient stomach acid is needed for optimal nutrient absorption! 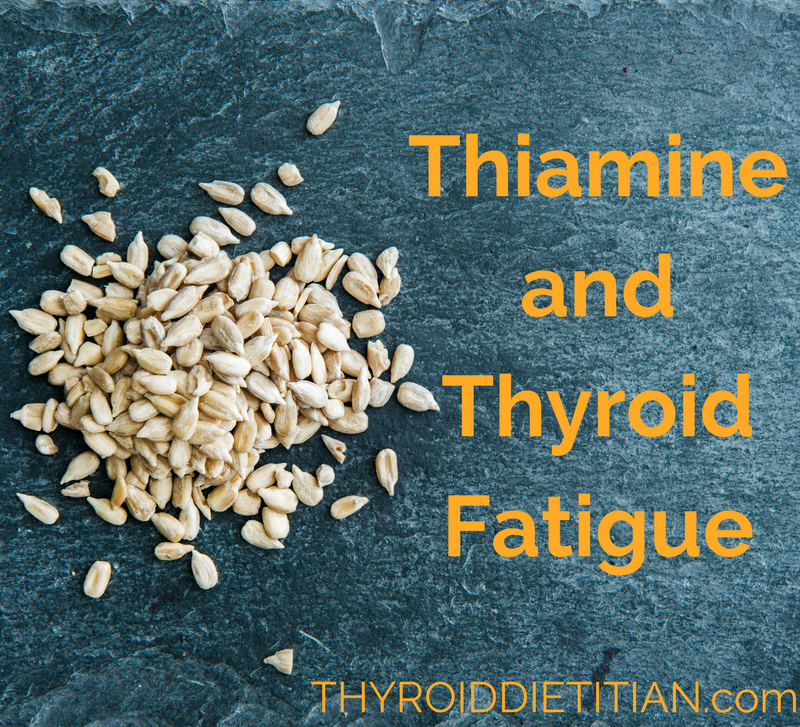 If your thyroid levels are coming back pretty optimal, and you are still tired, I would recommend trying out thiamine (speak with your doctor or dietitian first). If that doesn’t do the job, I would highly recommend getting your ferritin tested and even a full iron panel would be a good idea to rule that out. There are ways to test your thiamine levels, and that can be done with micronutrient testing through Spectracell. There are two options when it comes to thiamine supplementation. BenfoMax form of thiamine which is thiamine made fat soluble so it likely absorbs much better. Pure Encapsulations sells one option for this. Thiamine HCL which is your standard traditional water soluble form of thiamine supplementation. I would choose this one if you are on a strict budget since it is much cheaper. Don’t forget about food sources! These are just as important to include. Get the antioxidants as well as the nutrients! Sunflower seeds are an amazing source of thiamine, but can be tricky on our digestive system. We were not really meant to be able to digest a lot of seeds. 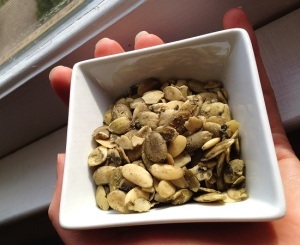 So, I always recommend sprouted sunflower seeds or at least sunflower seeds in the seed butter form to improve digestion. My husband likes to use sunflower butter in smoothies! These series of posts are not a substitute for medical advice. For advice and recommendations on supplementation, ask your Doctor or local Registered Dietitian. I am a big proponent of optimizing nutrients in order to improve thyroid health. There are many small things that affect the critical conversion of T4 to T3, and nutrients can be one of them. 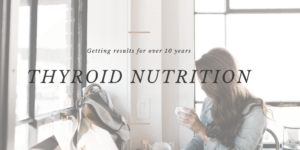 In this series of posts, we will dig deeper into each vitamin and mineral and how it may play a part in thyroid function! The vitamin known for keeping our vision and eyes healthy. I like to call vitamin A the “vegetable vitamin” since it is present in significant amounts in most all veggies and many fruits as well. I won’t dive deep into the nitty gritty of vitamin A types and functions since that could take all week. 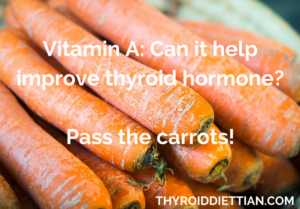 The thyroid helps convert vitamin A to a more usable form in the body. If you are hypothyroid, this proecss will not function as well. A 2012 study showed a link between supplemental vitamin A ro reducing TSH and improvement of other thyroid hormones. Extremely low protein diets may also contribute to vitamin A deficiency (which could then possibly reduce thyroid function). This is why I see many who lack nutrients and protein/calories have issues with high TSH and low T3, T4. Vitamin A very generally reduces inflammation in the body, but specifically, in the whole food plant form. I never recommend a vitamin A supplement since it is fat soluble and can easily build up in the body and become toxic. It is extremely easy to get loads of vitamin A from food. For example, eating just one medium carrot (not one baby carrot, but a regular size) provides 204% daily value for your day! This is much safer and healthy as well! What does magnesium have to do with thyroid health? It can often be overlooked as the cause of your fatigue or mood swings. Just remember that we need magnesium as much as other minerals since it is involved in more than 300 chemical reactions in the body! 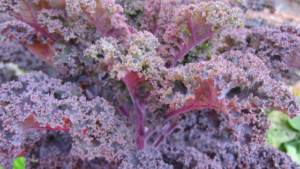 Importantly, a deficiency in magnesium can make it difficult for the body to reduce inflammation. And inflammation is a root cause of autoimmunity. Without magnesium, many body processes slow, which is similar to what it feels like to have hypothyroidism. We blame fatigue and various symptoms on the thyroid insufficiencies, but don’t forget to think about the total health of everything you are doing. What is the big picture? Magnesium could be the culprit especially if you are not following a healthy, balanced diet. 1. Leaky gut and an imperfect intestinal microbiome (bacteria in the gut). In other words, you may not be absorbing 100% of the nutrients from your foods. 2. Mega doses of vitamin D. Some report feeling symptoms of excess vitamin D intake when they do not take magnesium. Magnesium deficiencies will also be amplified if not supplementing with magnesium while taking vitamin D. For example, I start to get muscle twitching if I am not taking magnesium. Overall, if you are taking mega doses of D, magnesium is generally recommended as well. Of course, you are going to know what I recommend: Choose foods high in magnesium first! See how you feel with an improved diet. 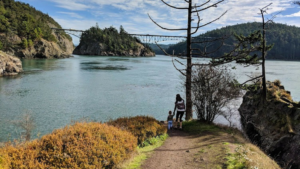 If you are still unsure if you are getting enough magnesium, there is blood testing that can be done to find out mineral and vitamin deficiencies. These are just some of the highest sources, there are plenty of other veggies, nuts, seeds, and legumes that contain good sources of magnesium. Since my diet contains a good amount of magnesium, I do not have to supplement with much additional magnesium. But, I still take about 100-200 mg of magnesium glycinate per day because I am supplementing with larger amounts of vitamin D3. This is low compared to what I usually recommend, but I am already eating a lot of cashews and seeds every day. Conclusion: Re-evaluate your diet, and make sure you are including plenty of magnesium-rich foods DAILY. See if your fatigue and symptoms improve. If not, feel free to contact me for a more complete diet analysis, and we can consider supplementation. In my patient experience, not enough people are getting their magnesium and they have symptoms that might be caused by inadequate intakes.